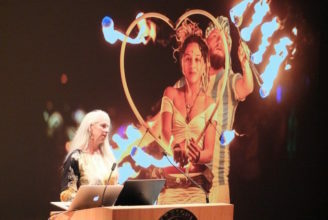 This is the seventh post in a series about “No Spectators: The Art of Burning Man,” the upcoming exhibition at the Renwick Gallery of the Smithsonian American Art Museum. A pride of Burners just descended upon Washington, D.C. for the opening of the “No Spectators: The Art of Burning Man” exhibit at the Renwick Gallery of the Smithsonian and surrounding neighborhood, and it was electric. Burning Man artists were invited to do a complete takeover of America’s open-to-all, no-admission museum located directly across from the White House. It was amazing to see our culture displayed with such regard. But something is missing in the mix: Burners. The show is thoughtfully curated by the Smithsonian’s Nora Atkinson, who imagined it for years before she ever set foot in Black Rock City in 2017. It presents stunning examples of sculpture, light and sound installations, art cars, patches, costumes, jewelry, photos, an effigy of the Man, even a magnificent Temple… all of those interactive marvels we have come to expect when we are welcomed home. But for all its abundant inclusiveness, the show cannot convey the ubiquitous dust, blistering heat, punishing windstorms, ambrosial bacon, odiferous portos, mystical confluences… and gloriously enthusiastic, sweaty, celebratory Burners. To truly reflect our principles, the exhibition needs the context of the dusty characters who make our culture so magnetic. If you were dropped into Black Rock City without waiting at the gate, setting up camp, or snow-angeling in the dust, you’d feel like we felt at the Renwick. The crowds of the curious are coming in droves, and most of them have never met a Burner. In the hours I spent signing books in the gift shop, it felt like a Ranger shift welcoming newbies to the Man Pavilion: How do you carry your water? Who decides what art gets to come? Are there really naked people? Was it better 10 years ago? Visitors are hungry for the context of this exhibition, and interpretation falls to all of us fortunate enough to suffer 80-mph winds, 50-degree temperature fluctuations, and fractured sleep patterns by choice. Just as in BRC, the show spurred meaningful interactions through engagement. When I invited a hearing and sight impaired gentleman to touch my costume displayed on a mannequin, to feel the leather and wool and silver studs and embedded dust, he lit up like El Pulpo Mecanico at dusk. On opening day, when many artists were standing next to their installations, two adorable sisters clutching the Burning Man: Art on Fire art book were inviting artists to autograph “their” page, yearbook-style. I offered to sign on the author page — and I’m not sure who was more excited about the serendipity of it all. Immediacy and Participation for the win! When the founders established the nonprofit Burning Man Project, their mission was to spread Burning Man culture throughout the world. The Renwick show is a giant step forward for Burning-Mankind. But you can continue to move it forward by going to see it as your best Burner selves, duct-taped boots and all. Throw on that knotted tangle of necklaces, stuff some of last year’s stickers in your pocket and gift them to every little kid you see. Stand next to your favorite exhibit and engage with anyone who looks curious. Just as you give two hours of mooping to BRC, add some extra time to see and be part of the experience at the Renwick or any of the six sculptures in the neighborhood. Let your freak flag fly, let your 10 Principles pulse. Let the world know what brings you to our experiment in temporary community, and what you bring to the world as a result. Help us know spectators, befriend them, and invite them to become participants. Check out Brody’s post for more details about how you can get involved! I am so looking forward to taking my brother and his family next month to show them some of why That Thing in the Desert draws me back year after year. Well said, Jennifer! As a lucky DC Burner, I’m volunteering there weekly through the summer. The crowd loves the exhibit, and the Smithsonian and has done a marvelous job of merging our edgy culture with the sensibilities of an international-grade exhibit. This feels like yet another milestone in the burner movement. Lovely post – thanks for writing, Jennifer! Your experiences at the Exhibit make my heart soar. Thanks for sharing. I dropped into No Spectators after work randomly last Friday, about a week after it opened, and was blown away. I loved it so much I went back Sunday, and am going back again today. I went in expecting it to be cool, I did not expect it to be such a profound emotional experience. I left knowing I HAVE to find my way to BRC to experience the real thing, dust and heat and odiferous portos and all. If not this year, then next. Surely there is a better collective noun for burners than that! !